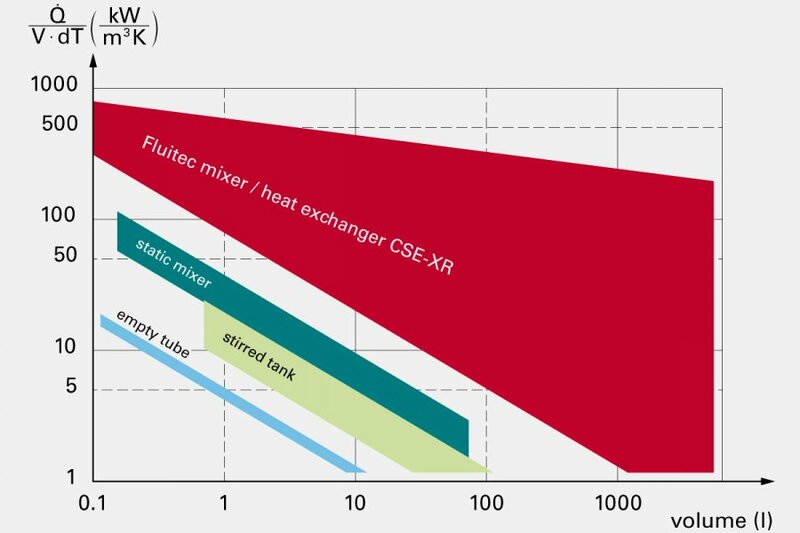 The Fluitec mixer / heat exchanger is a combination of a static mixer and a multitube heat exchanger. It can be used for mixing, heat and mass transfer or – thanks to its optimal residence time distribution – as a plug flow reactor. Since the design is consistently based on the geometry of the CSE-X – the most efficient mixer type of all – excellent homogeneity, a narrow residence time distribution and a uniform shear field over the cross-sectional area are guaranteed along the entire length of the apparatus. 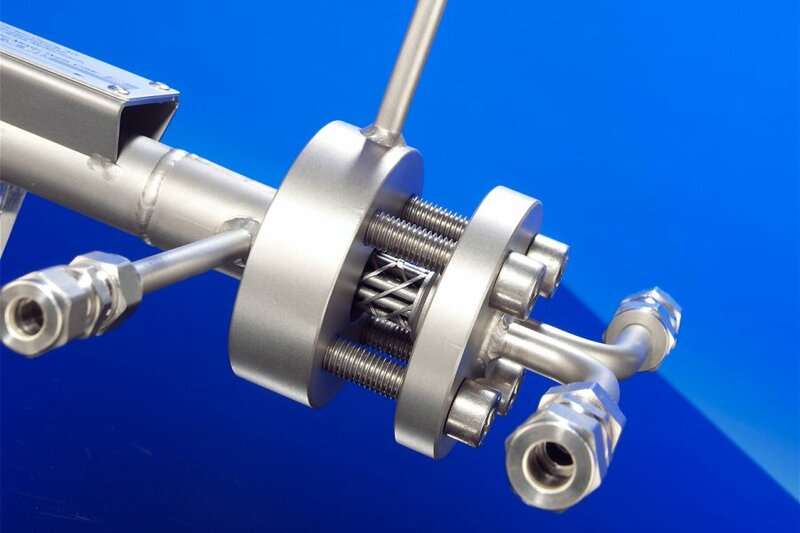 The very high radial mixing efficiency constantly ensures an intensive flow against the internal heat transferring tubes integrated in the mixing element. Far more heat is transferred than with heat exchanger arrangements with no internal elements (e.g. monotube heat exchangers, where the tubes have a double shell). From a fluid dynamics viewpoint, the heat transferring tubes are ideally positioned in the mixing element; this is very important since it facilitates the exceptionally compact design. Mixer / heat exchangers can be designed without any dead spots and make perfect tube reactors. 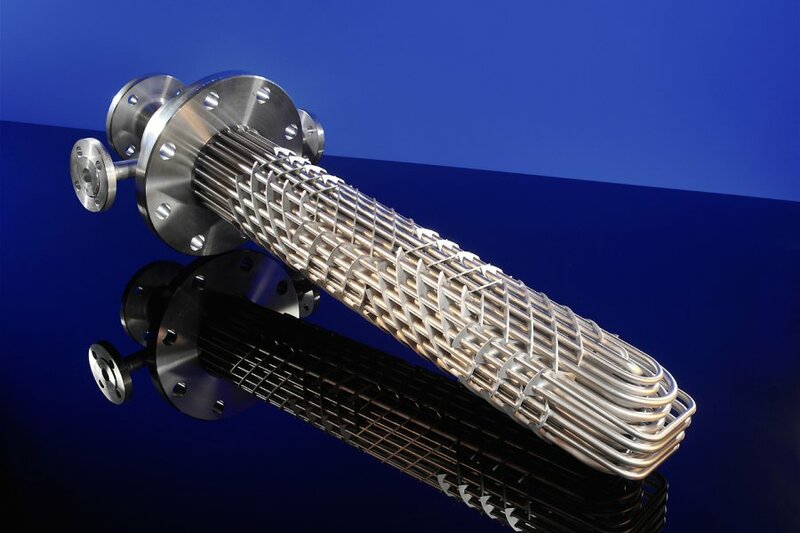 The unique design of the heat exchanger gives rise to extraordinary capabilities, which are particularly evident with complex cooling tasks. Even pseudoplastic (non-Newtonian) or thixotropic media can be mixed without any problems over a wide temperature range and with significant differences between the viscosity at the inlet and outlet or between the temperature of the product and the coolant. Owing to its ability to mix the product homogeneously for long periods, the mixer / heat exchanger rules out the risk of mal- distribution, which is a dreaded phenomenon with other heat exchanger types. The mixer / heat exchanger also enables combinations of different process steps because the apparatus permits simultaneous mixing and temperature conditioning of fluids. *) The apparatus also works with lower viscosities but in this case is less efficient than conventional heat exchanger designs. Applications and reactions where the residence time is critical are an exception. Fluitec sterile equipment is specially constructed for the greatest possible separation between the primary and secondary media, with practically total dranage on the product side. 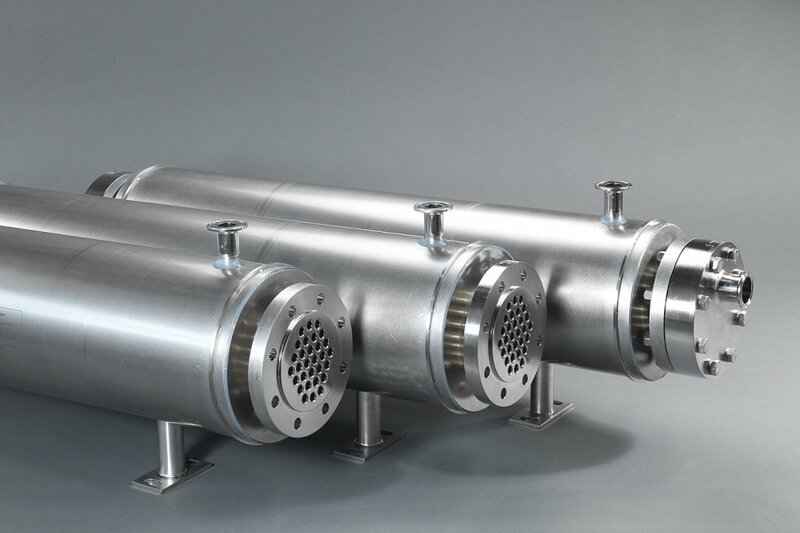 Fluitec sterile shell and tube heat exchangers are therefore ideally suited to CIP/SIP plants. A special surface treatment technique, plus seamless pipes with electropolished interiors, results in surface roughness as low 0.4 µm on the product side. Fluitec constructs the sterile-heat exchanger in licence of Calorifer Engineering AG.